Catseye vs. Howie Glatter and Blug?? Well, I agree that this has been a great discussion. So much so that I spent a couple of hours re-reading it. One thing pops into mind is that it surely would be interesting if someone could program a "virtual" reflector animation/program where you could learn to collimate by computer. Maybe show a cross section of a reflector and the views from the various tools with virtual primary and secondary knobs (and maybe the spider adjustments). These could be shown on the same screen so that the user could, say, tweak the primary collimation screws and see how that would change the view in a cheshire or autocollimator. You could mess up the collimation and practice tweaking it to achieve perfect collimation while the computer screen shows various points of view (the cross section of the reflector, the cheshire and the autocollimator). This could be done with either the Catseye system tools and/or laser/barlowed laser tools. The program could run a script which would run through the steps needed and show the views thru the various tools and how they change as you are tweaking in real time. If it was fancy enough, it would trace light rays in another window showing some of the stuff Jason did. The views thru the cheshire/autocollimator would look like Jim's POV-ray animations. Although I'd hate to see the end of these discussions if the program worked too well! Sounds like a great idea to me. I surely would find it very helpful. There are great diagrams in this thread but a virtual reflector animation program where the user could turn the various screws and see the results, would be a wonderful learning tool. ...it surely would be interesting if someone could program a "virtual" reflector animation/program where you could learn to collimate by computer. I think that's pretty much what Jim Fly is already doing with his POV-Ray 3D simulations. You could mess up the collimation and practice tweaking it to achieve perfect collimation while the computer screen shows various points of view (the cross section of the reflector, the cheshire and the autocollimator). This could be done with either the Catseye system tools and/or laser/barlowed laser tools. I've already asked Jim to model the Glatter laser (w/1mm aperture stop) for my online addendum, although it may be easier to just shoot the series I want with a digital camera. Jim's also working on a series modeling a tilted focuser that I hope to be able to put up on the website. None of this is as "easy" as it sounds! I'm sure Jim has spent countless hours mastering the software to the point where he can generate the simulations you've already seen. Building additional flexibility into the simulation requires much more than a good understanding of collimation. Turning the simulation into a auto-guiding game console that will directly or systematically resolve axial and secondary mirror alignment errors is a tall order. Including mechanical tilt/offset errors (i.e., focuser, spider, and primary mirror mounting cell) will add even more complexity. ...Although I'd hate to see the end of these discussions if the program worked too well! Somehow I doubt that a modeling program will replace these discussions--I suspect it would generate its own discussion threads! ...At lunch, went home and plugged in the Glatter with the 1 mm stop and centered it as carefully as I could...Put in the Catseye AC and it was the best image I've seen...It seems that if I can do it repeatedly all with the 1 mm stop, then all this will seem very simple. I wonder how easy it would be to see the 1mm stop from the back of a truss, maybe even in the secondary? I go back and forth with my 22SST (f/4) to align the primary mirror with the 1mm aperture stop--it only takes a minute or two. But if you're primary mirror has adjusting and locking screws, I would seriously consider stronger compression springs so I could get rid of the locking screws. I collimated a friend's 10-inch f/4 astrograph at Chiefland with 3 adjusting and 3 locking screws on the primary and it took several minutes of hit-and-miss adjustments to get the alignment spot on. Thanks a beaucoup (a red neck cajun variation of a bunch). The slang version I grew up with was, "Mercy buckets!" I understand that programming a "Virtual Collimation Hero" game is not just a walk in the park. Certainly the POV-ray animations, graphs, and video clips are a great help in understanding collimation and what you see in the various tools. But despite these discussions, many seem to be confused/intimidated by the collimation process. Personally I have no idea how big the reflector installed base is and what the potential sales are for premium (or basic) tools. How much of that base has these tools and how many would buy them if they could more easily get their arms around the techniques described in this thread. It seems when you guys (Vic, Don, etc.) describe helping others at star parties, that most reflector users seem to be struggling with basic tools (collimation cap) or poorly collimated lasers. I would assume that a lot of these users are making the decision on which tools to use/buy based upon economic decisions (obviously a good tool set rivals the cost of a low-end reflector). Many probably are confused and are suffering from paralysis by analysis. I think my own case is fairly illustrative of what others might be thinking. Three years ago I bought an Orion XT12i which comes with the collimation cap. My daughter's school had a science night about four years ago. There were several telescopes set up outside including a monster reflector. (It must have been a 30"er or so but I had no experience with scopes other than a Meade ETX 90 at that point. Needless to say, the view thru the reflector was a tad better than the Meade ETX.) So the view through the scopes at the science night inspired me to buy the 12" reflector. Not having any experience at that point, I collimated with the supplied collimation cap. It certainly is confusing at first. I got close with the cap but was always in doubt as to whether the collimation was optimal. So I bought the Orion Lasermate Deluxe. It goes without saying how accurate this laser is. After further reading (Nils piece), I barlowed the Lasermate Deluxe with a 2" GSO barlow. That seemed to work okay and I think my collimation became better. Still, there were times when the scope gave great views and not-so-great views as I tweaked the collimation (holding the seeing constant). So I bought a JSP autocollimator (an autocollimator is just an autocollimator, ugh). Over this time I also acquired an Orion 1.25" cheshire/sight tube. My toolset kept growing, but my confidence in collimation wasn't. So finally, I bought Jim's Catseye tools. I read and re-read the instructions on Jim's site and followed the collimation discussions on Cloudynights. My collimation skills increased with great effort. The illustrations and video clips helped for sure. After all this, I think I have a decent understanding of the collimation steps. Actually collimation is fairly easy. My point is it took a great deal of effort to get to where I am today. Now looking back at the experience, it should have not been so hard. I think clear instructions with better visual documentation is what helps. There have been numerous discussions on Cloudy Nights about this. Many have taken photos looking down their drawtubes. Jason has drawn a gazillion illustrations. Vic, Don, Sixela and others have spent countless hours explaining the necessary steps. As others have pointed out, it is hard to learn to ride a bike by reading how to do it. You have to get on it, fall down, get back up and try again. The same is true of collimation, you have to tweak the knobs and see what happens. And you need to know how to interpret the views through the tools. Looking at Jim's website again, the instructions are mostly textual (a word?). Sure there are some video clips and illustrations. I understand from this thread that Jim may be working on some additional material. Certainly the new material presented in this thread is valuable. To make a long story short, this is why I think a virtual collimation telescope is a good idea. I am sure it is a lot of effort. If done properly, it would surely shorten the learning process. I would assume it is a business decision. Would such a tool increase sales of collimation tools such that it is worth the effort? It really is the vendor's decision. In my case I think I would have bought the premium tools earlier on if the collimation process was better illustrated. Maybe a virtual collimation game is a little over the top, but better step-by-step instructions with visual information certainly helps. I would think it would help sell tools, whether passive or lasers. I think the continued prevalence of these threads illustrates that there is still a gap in explaining the collimation process. No doubt it's getting better. I apologize if this is in Vic's new book. I will order one soon. I did just put an order in for Howie's tools, largely because of this thread. A man can't have enough collimation tools! Thanks everyone for this thread! Puzzled and amazed and how simple life can be....at least for now. At lunch, went home and plugged in the Glatter with the 1 mm stop and centered it as carefully as I could in the focuser and then centered the laser in the triangle with the secondary screws and then got the little red rabbit back in the hole it came out of with the primary knobs and it appeared that there were concentric circles (similar to a star collimation) around the center hole of the 1mm. Then put in the Blug and it was centered (or very close to such). Put in the Catseye AC and it was the best image I've seen. Everything seemed centered and no ghost triangles. Then put in the TuBlug and it was also giving a good test. Now to mess it all up tonight and try it again. It seems that if I can do it repeatedly all with the 1 mm stop, then all this will seem very simple. I wonder how easy it would be to see the 1mm stop from the back of a truss, maybe even in the secondary? Just remember to compare what you see with the Blug until you really get the hang of seeing the diffraction rings and centermark shadow. 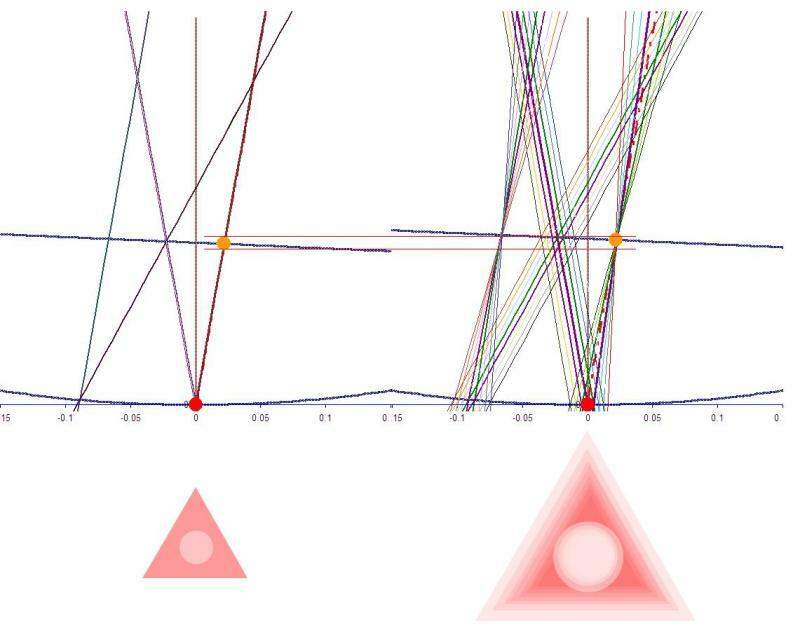 The return beam of the laser by itself, diffraction circles notwithstanding, isn't the best way to line up a primary. Though, admittedly, if the alignment of the primary is way off, the return beam of the unbarlowed laser will at least put you in the ballpark for easy collimation of primary tilt with the BLUG or barlow attachment. I've seen many people in the field collimate their primaries with the return beam of a single beam laser. So it might be worthwhile to mention why the return beam of a simple laser isn't up to the task of collimating a primary. Let's say you adjust the secondary to put the laser beam outside the primary's centermark. Could you adjust the tilt of the primary to return the beam to its source on the bottom of the laser? Yes. Would the telescope be collimated? No. The point is, there will be some error in having the laserbeam hit the center of the primary, but you can always adjust the primary to return the beam to its source. And, with most lasers, estimating the center of the primary's mark to the necessary degree of precision isn't possible because the eye is either too far away, the beam is too bright, or the beam shape isn't small enough to accurately assess the center of the mirror closely. Now if the beam hits exactly in the center of the primary, the return beam will hit the source in a perfectly collimated scope. So how can you tell if you're compensating for an inaccurate centering of the laser with a tilt error in the primary? Well, one way is the cheshire. Another way is the barlowed laser technique of Nils Carlin. Another way is a Krupa collimator. And, another way is to reduce the aperture of the laser until the laser beam has a diffraction pattern where it hits the primary (the small size of the beam, coupled with the diffraction pattern, makes estimating dead center a lot easier). This last way, as some have discovered, results in a return beam from the primary to the laser that not only contains the diffraction rings around the central laser beam itself, but also the shadow of the primary's centermark within the diffraction pattern--in essence, similar to what you would see with a barlow. So you can center the shadow, as you'd do with a barlow. Of course, the fact the laser is not diffused, as with a barlow, means that shadow is a little harder to see and center. But, as Vic has found out, this works quite well and gets you quite close to perfect collimation quite quickly. It goes without saying the laser must be accurately collimated, and have a very small aperture stop (1mm or less). I've done some experimenting with an accurate laser with a 0.8mm aperture stop, comparing it to the Catseye TeleTube sight tube, and I get nearly equal accuracy with either. I actually looked at the primary from up close (shroud lifted) when using the laser, and used a diffraction point in the crosshairs to center in the primary's centermark. [a little discussed characteristic of vision is that when the sight tube's crosshairs are thin and at a non-focused distance from your eye, the crossing point produces a diffraction "dot" that you can center in the primary's mark for greater accuracy]. De-collimating and aligning with either method gave me equal results when checked later with the autocollimator. We are becoming blessed with an abundance of good techniques in collimation. What we need to do is keep harping about the use of collimation caps and inaccurately-collimated cheap lasers with 45 degree windows. There is no reason these tools could not be made better with a little more care on the part of the manufacturers. For now, though, we have a handful of companies producing good tools, and that is probably enough. ...My point is it took a great deal of effort to get to where I am today. Now looking back at the experience, it should have not been so hard. I understand what you're saying. Unfortunately, the same people who decry the complexity of Newtonian alignment are quite often the ones who push the discussion into areas that are more complicated than, for example, simple axial alignment. If more users would take the time to really learn how to use a sight tube, I truly believe they would spend much less time in these collimation discussions looking for an easier solution. ...And you need to know how to interpret the views through the tools. Each new graphic series brings us one step closer to a pictorial interpretation of the various misalignments. It's when you start dealing with the many possible combinations of misalignments that complexity starts working its way back into the solution. Experience helps (a lot!) but until the novice has gained the necessary experience, he needs to be able to fix the specific errors that are causing his scope to perform poorly (understanding that his performance expectations may not be realistic). To make a long story short, this is why I think a virtual collimation telescope is a good idea. 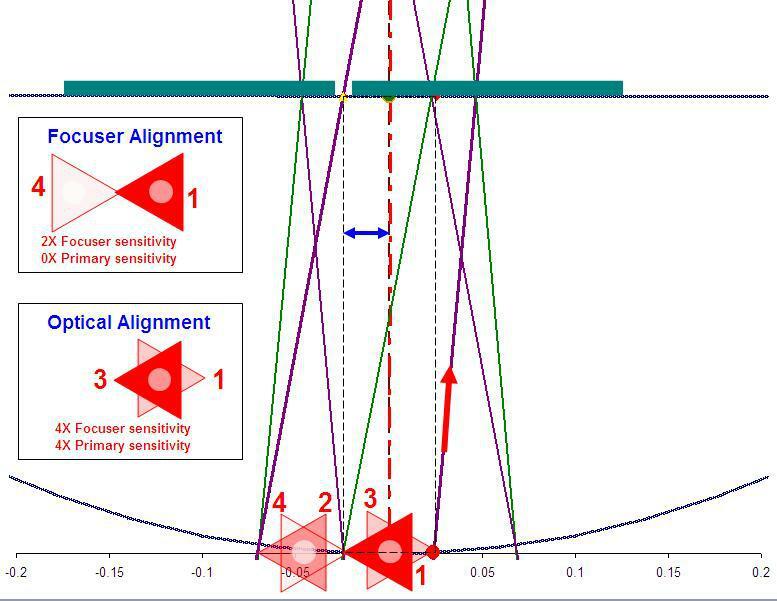 I suspect before you see a user-friendly virtual collimation application you'll see a video walkthrough of the more common misalignment solutions, a basic "show and tell" workshop of sorts. I suspect as long as there are gaps in a user's understanding there will always be gaps in any explanation--and that's discounting the significant number of users who simply will not get it until they see it on their own scope. If I can get 50-percent of the readers of the fifth edition to use at least one of the elegant solutions in the book that they weren't using before, I'll consider the fifth edition a huge success. Unfortunately, there are too many Newtonian users today who would have given up long before you did. Even if it isn't easy at first, the learning process isn't that hard! When you do, assuming you find a valuable resource in one or more of the elegant solutions, I'd like to hear your thoughts. I did just put an order in for Howie's tools...A man can't have enough collimation tools! IMO, you're well on your way to having the collimation tools you should have! ...Just remember to compare what you see with the Blug until you really get the hang of seeing the diffraction rings and centermark shadow. The return beam of the laser by itself, diffraction circles notwithstanding, isn't the best way to line up a primary. Unless the focuser axis is aligned perfectly to the primary mirror center mark, you should always use the silhouette of the center mark to align the primary mirror, just like Don says. But if you take your time and get the diffraction rings precisely centered in the center mark silhouette perforation (it's not that hard when it's right under your nose assuming you can easily see the 1mm aperture stop from the front of the OTA) when the center mark silhouette perforation is aligned with the 1mm aperture hole, the diffraction ring inside the perforation and the broken rings outside the center mark will also radiate concentrically from the 1mm aperture hole. Using the 1mm aperture stop this way often delivers a perfect stack in the autocollimator. Personally, I would trust the 1mm aperture stop (showing both axial alignments) over the Blug. We know the laser is registering to the focuser the same way an eyepiece/Paracorr would, but there's always the possibility, especially if the bottom of the focuser drawtube is threaded (i.e., for filters), that the self-centering Blug may end up slightly offset from the focuser (eyepiece) axis. Until you've confirmed that the Blug gives the same alignment read as the self-Barlow or 1mm aperture stop accessories, go with the result that fits like the eyepiece fits. Actually, I've pondered the concept of a "no-pupil" AC mirror for a long time. The compromise is that typical 1-way (sometimes called 2-way) mirrors are made by actually reducing the reflective film deposit thickness sufficiently to allow light transmission (for viewing through the mirror) which of course will reduce the reflectivity. We certainly don't want to (literally) "loose sight" of that 4th image so important to the CDP. There is one more reason why a 2-way mirror will not fair too well with CDP. See attachment. Let us consider only and only the â€œfourthâ€ image that is formed after 3, 7, 11, 15, â€¦etc AC reflections. This is the image used for CDP. Only when the pupil hole is at the focal plane, the fourth image will form discreetly. The 2-way mirror will continue the reflection paths and show more reflections but since the AC is at the focal plane, all reflections will have the same size and overlap forming one image (well kind of). That is, image 7 will be the same size as 5; image 11 will be the same size as 7, and so on. Now, when we move the AC away from the focal plane, then every reflection will be little larger than the one before and we will end up with a fuzzy image. Thankfully, the pupil hole will stop images 7, 11, 15, â€¦etc from forming and only display image 3. Note: In this post, I am using the â€œP123â€ convention â€“ not the â€œ1234â€ convention. Attachment: The figure to the left simulates 15 AC reflections with the AC at the focal plane. Light rays will keep retracing their paths. The figure to the right simulates also 15 AC reflections with the AC above the focal plane. You can see how successive reflections will continue to widen which indicate successive magnifications. ...Thankfully, the pupil hole will stop images 7, 11, 15, â€¦etc from forming and only display image 3. In the "P123" convention, reflection 3 is rotated 180-degrees. Is 3 not visible in your simulation? Good heavens! This thread has been a series of Eureka moments. I just took an autocollimator to a perfectly collimated scope and ran it in and out, watching the edges of the stack as I did so. All this time, I had thought that it was my vision that made the edges of the stack slightly blurry. Then, Jason posts the thread I refer to above and the light goes on. I finally put it together with Jim's earlier post and now I see how important it is to have the autocollimator at the focal plane of the scope when doing the analysis. In the scope, as I moved the AC out away from the focal plane, the triangle stack changed in front of my eyes. No wonder I was able to sometimes see the perfect stack as a Star of David, but not other times. No wonder I thought the stack was blurry sometimes and not others. Now to come up with a simple method for determining the focal plane of the scope--waxpaper? Vic, I only included images 3+4*N where N is an integer. With a 2-way mirror, all N's are visible. With a pupil, only N=0 is visible. Note#2: Interestingly, I am noticing the center of each consecutive larger image will minutely shift away from the primary center in the example I included in the previous post. I believe this is due to parabolic effectâ€“ maybe!! I wonder if you could model P and 3 only and show how the stack varies as distance from the focal plane increases (and decreases). It might also be interesting to show the relative distance from the focal plane as a percentage of the focal length. The more I think I know, I come to realize it is really only indicative of how little I truly do know. This also explains why sometimes the image is perfect and without noticably moving it changes. I could be an eyemovement, a contact lense shift, or drying or both or a myriad of other things. So for me collimation will have to be in a bell shaped curve with a certain level of confidence. Outside that level and it is out, inside that range it is in. But perfect collimation is probably a constant variable that is within the range of not being noticeable. Probably it is like the perfect cherry blossom the last Samurai was looking for. Many are beautiful but so few are perfect. Never the less, I am going to strive for as close as I can get, knowing full well I ain't there, but if it is close, I don't think my eyes will know the difference. Like I mentioned in my earlier post, I can align my 22SST f/4 with the Glatter and 1mm aperture stop and I often find the autocollimator shows a perfect stack with no additional tweaking. My mechanicals are top notch (including a FeatherTouch focuser) but I would think once your primary and secondary mirror are secure your focuser should deliver similar registration consistency. Sometimes I pop the Infinty XL in the focuser and I see a close jumble until I gently tighten the retaining screw. Other times I can just apply a little pressure to the Infinity XL in the direction the retaining screw will move it and the reflections immediately stack on their own. Vic, based on ray simulation, the error can't exceed the distance between the pupil hole center and the optical axis. When the pupil hole is at the focal plane, the error is zero. As the AC is raised, the error starts increasing gradually and approaches the distance between the center of the pupil hole and the optical axis. Therefore, the error seems to be less than the CDP error introduced by the pupil hole size. I apologize, I should have stated the scenario more clearly. I'm not concerned about a CDP scenario--it makes sense that if the primary mirror is decollimated a certain amount at the focal plane, that amount will change as the pupil position is moved along the focuser axis. I'm not sure if that's clearer or not? First column is the percentage of AC hieght above focal plane with respect to the focal length. The remaining columns correspond to magnification% of "1", "2", and "3" with respect to "P". "1" gets smaller, "2" and "3" get larger but "3" has faster rate. Very lucid statement. You have a flair for writing. For now, though, we have a handful of companies producing good tools, and that is probably enough. Okay, I'll bite. Could you list some members of this handful? In addition to Howie Glatter, who else makes sufficiently reliable laser collimators, in your experience? Could you adjust the tilt of the primary to return the beam to its source on the bottom of the laser? Yes. Would the telescope be collimated? No. I just wanted to add that under the above scenario described by Don, the lateral error at the focal plane will be 1/2 the lateral error at the primary surface. That is, a laser beam that misses the primary center by 4mm will shift the primary focal point by 2mm away from the focuser axis. Though this is probably not a complete list, I have experience with the following brands of collimation tools and all seem excellently made and executed: Tectron, Catseye, Astrosystems, Howie Glatter, FarPoint. There are others, probably, but these I can vouch for, having tested the tools in jigs. I have tested other tools not as accurate--for instance one brand of combination cheshire/sight tube in which nearly all the crosshairs were off center (!). And, to be fair, several brands of lasers can be collimated, even if they don't come out of the box that way. What do you think about the following idea? Instead of placing the pupil hole dead center in the autocollimator, let us place it off-center. The amount of the offset equals the distance between the triangle spot center and the tip of the triangle. 4-	Primary axis alignment is met when images â€œ1â€ and â€œ3â€ form the Star of David. Image â€œ3â€ is brighter/crispier than image â€œ4â€ which will make it easier to align. Furthermore, image â€œ3â€ will not disappear upon perfect collimation. EVEN BETTER, sensitivity is 4X which will further perfect the critical primary axial alignment. According to my analysis, the 4X sensitivity is true for both focuser and primary axes â€“ two birds with one stone. 5-	The final perfect collimation image will display two Star of Davids with touching tips. 6-	Note: The autocollimator will have to be rotated in the draw-tube to line-up all images â€“ no more jumbled images. Assuming I did not mess up in my analysis, this approach seems to be the right way to build auto-collimators. 1- If the pupil offset can't be smaller than the radius of the center spot. If it is larger, then the Stars of David will still form but will not be touching. Not as nice but still manageable. 2- Another twist to the idea is to have another pupil -- same offset but at 90 degrees. That will give the user two ventage points to align the images. 3- The 90 degree pupil holes can have different offsets. Only one that is closer to the radius of the center spot (but not smaller) can be used and the other ignored. 4- We can't have two opposite pupils opposite otherwise the disappearance act will surface. 5- Maybe having 3 pupils at 120 degress is not a bad idea. ...What do you think about the following idea? I think it's dependent on establishing the primary mirror axis first before attempting to align the parallel axes--and verifying the primary mirror axis after would also seem prudent. Vic, I would start off with aligning the focuser axis first then the primary. See attachment. Starting off with a slightly miscollimated setup, I would rotate the pupil-offsetted-AC to line up all images, then use CDP to align the focuser first by establishing a bow tie shape (images 1 & 4). Finally, I will align the primary with great precision by forming the two Stars of David (images 1 & 3). Image 4 location is insensitive to primary axis rotation around the primary center. That is, as long as the focuser axis alignment maintained, image 4 location will remain stationary. Come think of it, for this proposed method, I would not use triangles -- plain circular donut spot might be better -- because there is no guarantee we will end up with the right triangle orientation as shown in the attachment.